I asked for a specific things for Christmas, and my kids came through in spades. 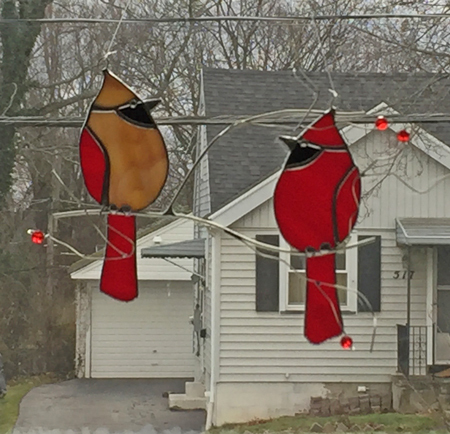 Most aren’t particularly photogenic, but these 2 are, both from LaBrise Stained Glass. 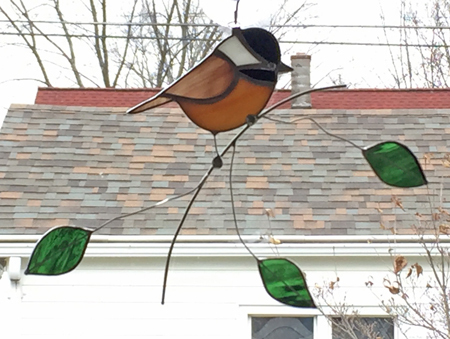 …and a sweet chickadee in the studio. On the weaving front, in a reply to a comment on that post about the weavies, it occurred to me that I didn’t know if a single weavie would reasonably suffice as a mug rug. Would the wool transfer moisture to the table/surface underneath it? I wanted to know, because I didn’t think I could sell any if I priced them high enough to account for the work involved in making 2 weavies, sewing them together, and stuffing them. So I did an experiment. I got 3 different of my test weavies. From left to right they are a single strand of sock yarn, a double strand of sock yarn, and a single strand of worsted weight wool. 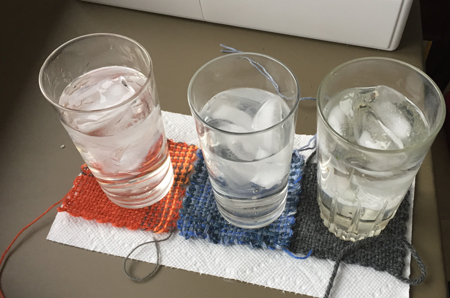 I put a paper towel under the row of 3 and a glass of water with ice cubes on each. I figured I’d be able to more easily see if the paper towel got wet/damp than my table top. I waited. The ice melted but nothing happened. The glasses didn’t sweat, which was needed for the test. So I dumped out most of the remaining water, and filled each glass up with ice. Now they’d sweat for sure. The bottom line? The sock yarns, which are a fiber blend, transferred a tiny bit of moisture to the paper towel; the worsted wool transferred none. So I think I’ll make some to sell this summer and see what kind of interest I get. Weavies are a great thing to do in the evening while I’m watching TV. Moving on, I did get those ‘beach’ towels from the last post woven and off the loom. I intended to do the hand hemming last night in front of the tube, but Jack decided he MUST have more attention, so that was the end of that. While I was weaving the towels I tried to figure out what I wanted to weave for jury photos. 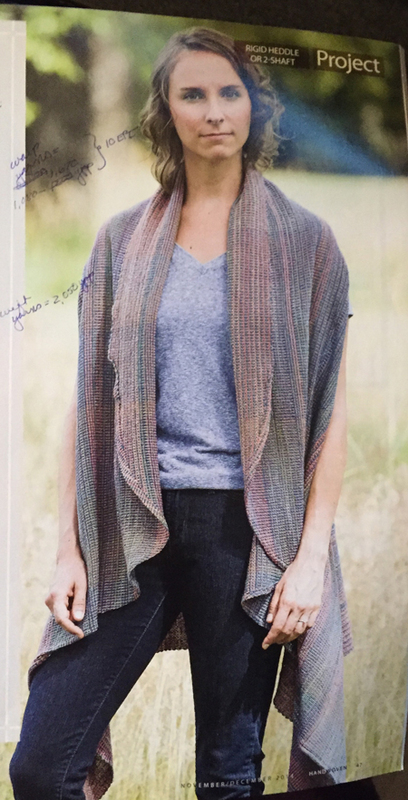 I decided I’d try the circle shawl from the November/December 2014 issue of Handwoven. I’ve looked at it several times since 2014, so now I was going to jump in. Of course I wanted my own interpretation, basically just using their measurements for a finished piece. I planned the whole thing out with some beautiful, thick-ish mercerized cotton. Then it was time for bed. By the next morning I realized I wouldn’t like the plan. Why? My warp would be in stripes because I didn’t have enough of any single color of the yarn, and those stripes would end up being horizontal in the finished piece. I don’t like wearing horizontal stripes, and figured others would feel the same. Hmmmmmm…..think again, Peg. I didn’t really want a solid color warp. Using a variegated yarn in the weft has never pleased me; I really only like them in warp. How would I solve this problem? Another lightbulb, and another pass through the stash and I found some beautiful bamboo-cotton yarn that I’ve had for a few years, hand painted by another fiber artist. I’ve now measured out that warp and plan to get it on the loom tomorrow. While I was winding I realized I have 3 very cool options for some novelty yarn that would look smashing with this warp. But again, they’d be horizontal stripes. So I’m going to try to use them in the weft. We’ll see how that goes. Love those birds – have already gone and favorite her shop for future purchases. Thanks, Cindie – Aren’t they great? They make me smile every time I look at them. Oh my those are lovely. I adore my little nuthatch from LaBrise and have the sho[p bookmarked in Etsy. I LOVE those colors in your warp! It was your post that sent me to LaBrise, Theresa. So glad I did! 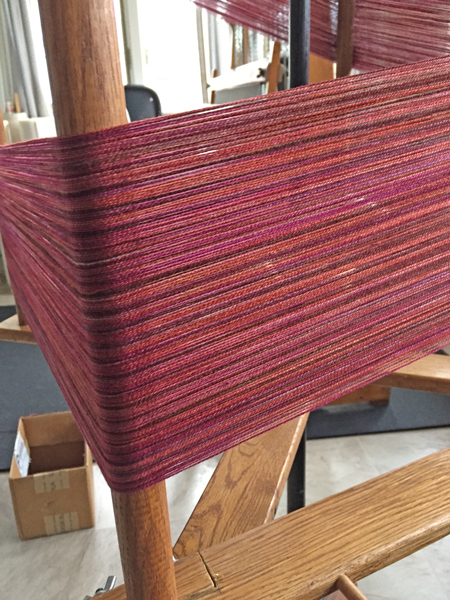 On the warp, now I just have to hope that I can find the ‘perfect’ weft to show off the colors best.